Our first road trip with the new furry family member is scheduled for next week! We’re headed back to San Diego, which is about six hours from Phoenix by car. This will be a way to see if Pup can handle longer trips next summer. So far, he seems amenable to riding in the car. Doggie is fastened and ready to go! One end of this seatbelt clicks into a regular seatbelt lock. The other end clips into the ring on Fido’s harness. It gives him some freedom of movement in the car, but not enough that he goes flying off the seat should you need to hit the brakes quickly. 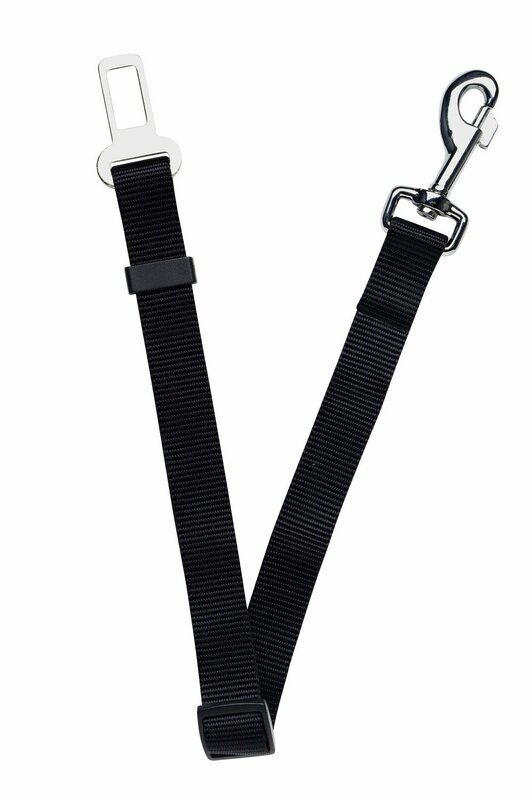 Nylon car Safe-T-Belt clips into standard car seatbelt locks and onto your dog’s harness. This little rice-sized microchip carries your contact information should your pet become lost. Almost all vets, shelters, and pounds in the United States have a microchip scanner, so if a good samaritan takes your pet to one of these locations, or if the city pound picks her up, all they have to do is scan her back to find out how to contact you. The microchip is injected in between your dog’s shoulder blades at a vet’s office. The cost varies per veterinarian, but it averages about $45 per pet. Home Again charges an annual fee of $18 to maintain membership, but having the peace of mind is worth it. In the video below, Betty White provides some helpful information about microchipping your pet. This is probably obvious, but it’s an important one for keeping Trixie safe whenever she is outside of the car, hotel, or vacation rental. Even well-trained dogs that normally walk off-leash can become overstimulated by new surroundings, so it’s a good idea to leash them up when traveling. Our particular dog is hard of hearing, so he can never go outside of a fenced yard without a leash. A harness is a good option for most dogs because it doesn’t press against the trachea and cause them to choke. As a citizen of the world that lives with other citizens of the world, it only makes sense to carry poopy bags wherever you take your dog. No one likes looking at or potentially stepping in dog waste. Plus, because it is used by flies and other small creatures as a place to raise a family, as it breaks down and gets absorbed into puddles, ponds, and lakes, it can be a source of giardia, a nasty parasite that can take its toll on human and canine stomachs, should it be ingested during swim breaks or lapped up by a thirsty pup. Our favorite doggie bags are the BioBags Dog Waste Bags. They decompose rapidly in the landfill. At the very least, we all have access to plastic bags from the grocery store. Those can also be used to clean up after your dog. The Water Rover is a convenient way to carry water for your pooch when you’re out and about. The lid has a built-in bowl. When you pop the stopper and lean the bottle over, water pours into the bowl for your dog. When you’re ready to get back on the road, just tilt the bottle upright to let the water wash back into the bottle. Press the stopper back in place and you’re ready to go! It is also dishwasher safe! Water Rover water bottle comes in a variety of sizes and colors. Pack up an airtight container of kibble to last the trip so you don’t have to race around to find a pet food store and your dog doesn’t have to get used to a new brand of kibble, should his brand be unavailable. It’s a good idea to throw in a measured scoop as well so, even if you’re overeating on vacation, Max can keep his sporty canine physique. Favorite treats, especially those made by local barkeries, are helpful for those times when he needs extra motivation to get back in the car, or just as an additional treat while you enjoy your own lunch on the road. Our favorite barkeries are Furbabies and Happy Tails. Furbabies Delectable Delights are available through their online store or in select Whole Foods. Happy Tails also has an online store, or if you’re local to Phoenix, they are at the Gilbert Farmers Market every Saturday morning. Paper towels come in handy to clean up muddy paws, drippy jaws, and anything else that needs mopping up. According to The Hitchhiker’s Guide to the Galaxy, a traveler should never leave home without a towel and that goes double for traveling with your dog. It can be used as a blanket. It can be folded and used as a bed or pillow. And, of course, it can be used to towel off a dog that has just come from romping in the lake, ocean, or pool. Having familiar things around, especially favorite toys, may cut down on a dog’s anxiety while traveling. It will also give him something to chew on, squeak, and destroy when he becomes restless from sitting in the car too long. Playing with a familiar toy can ease anxiety for a dog. Whether your dog’s favorite spot is inside her crate or curled up in her special bed, don’t forget to bring it along on trips. It will help all of you rest easier during the trip and cut down on stress-related issues that might arise from your dog’s nervousness at being in a new place. Of course, you’ll need to include some stops along the way for potty breaks and to stretch the legs. Look out world! Here we come! Can you think of anything I’ve forgotten? How do you travel with your pooch? ← Worldwide Recess Day is here! I cannot wait to read about the wonderful adventures of Lukas! Thank you! He gives us so much joy. A complete list! Now I can’t wait to hear how the road trip and San Diego adventures went with doggie in tow! 🙂 yaaay!